When our heroes take in a little shore leave at a prosperous Sebacian separatist colony, drinks and kisses abound until two things go wrong: 1) Scorpius shows up, and 2) John gets himself engaged to the princess, dropping him in the middle of a bitter power struggle. Man, so much goodness crammed into a single episode. Which is just the first chapter of a three-parter! I hardly know where to start. I guess the beginning. It’s official: Farscape has couples. Or at least one in the form of the constantly naked Chiana and D’Argo who are screwing each other limp at just about every opportunity. I think it goes without mentioning that Chiana is always on top. Which I just mentioned. Oops. And then we get John and Aeryn, which seems to be going good as a flying lesson takes on a bit more snuggle when he notices the fine aroma of her freshly washed hair. But before it gets too far, Aeryn yanks free, refusing to be a “slave to his hormones”. Throughout the episode, her feeling for John are clear to pretty much everyone, but she keeps pulling away. I’m guessing this is something they’ll build on in the next two chapters. Bring on the Sebacian planet, which looks like a Coruscant city with an ocean view and a giant Tyrell pyramid. Dynasties and heirs are such a driving force of their society that they’ve developed a chemical that allows people to find out if they’re genetically compatible by essentially Frenching one another. John, spurned by Aeryn, starts making out with ladies left and right until he ends up with the Princess Katralla on the other end of his tongue. He was planning to make Aeryn a little jealous, but now he’s suddenly being offered the throne and a batch of heirs. Offered is a strong word. Forced is more like it as Scorpius shows up and the Empress tells Crichton it’s either the Princess or the Aurora Chair. Why? She’s desperate to keep her son Clavor off the throne because he’s striking back-door deals with Scarrans and the lasting peace will likely collapse as a result. Speaking of, this is our introduction to a full-blooded Scarran, which looks like the love-child of Nosferatu and the shark from Jaws. It seems they have the ability to produce a heat ripple mind wave that peels back the mental resistance of their victims, much like what the half-breed Scorpius artificially performs through The Chair. I’m guessing it’s his body’s issues with heat that keep him from doing it naturally, leaving him once again bound to technological imitation. I don’t entirely remember how the other two parts play out, but this is a fantastic opening act. Zhaan and Pilot conflicted over immediately Starbursting away from their allies at the sight of Scorpius’s Command Carrier. D’Argo willing to hear the offers Scorpius is laying on the table. Rygel in full on Eminence mode. Aeryn in a beat-down, drag-out brawl with a Scarran. Chianna doing fascinating things with her hips. John torn between a rock and hard – oh, hey, check out the hologram baby he’s already calling “Slugger”. I’ve been looking forward to this episode since we started this project. Multiple reasons: First, a fantastically high opinion of the three making up the “Look at the Princess” series; second, a worry that the episode(s) hadn’t actually been as good as I thought they were at the time. I took a book of notes again. These three episodes are easily my favorite of the series, and I may wind up typing for… ever. I should get fashion out of the way early. Zhaan is in a new gold mantle, less elaborate than the heavy collar, but definitely fancier than the fuzzy thing or the miniature galaxy. Partway through she upgrades it with cool purple vestments. There’s a neat distinction drawn between the locals in their loose white clothing and the foreigners wearing tight black and red leather. Also: Does anyone see a similarity between the male foofy jackets and Maldis’ coat? Emphasis on foof. And of course, Crichton’s hair: Largely calm, with moments of agitation. “There’s a Sebacean down there that your sister hasn’t kissed yet.” Implying that she’s kissed every other male on the planet. Depending on the size of the population, that’s possible. Even probable, given the precautions they take to ensure healthy children. A small number of colonists would need significant planning to prevent inbreeding. …nearly two thousand years after colonization. “I will speak with you… later.” I love that line. Just the delivery. Utterly pompous. That Scarran? Something like that impregnated a Sebacean to produce Scorpius. So completely wrong. Alright, I think I’ve got this down to the point where I can start tackling it chronologically. Aeryn opens the episode tutoring John in combat piloting. Of course, being in such intimate company has consequences that rapidly go sour. Complete with module eject button! Luckily Chiana’s right there to say her piece on the subject. When John looks in on her several arns later… well. There’s a trope under discussion for “Coitus Interruptus”, but at the time of this writing it has not yet been implemented. This one probably works better as no interrupting actually occurs. D’Argo immediately hits John with a guy-to-guy talk, explicitly stating “Don’t. Blow this for me.” The group descends to the planet, where everyone hits the bar and Crichton starts making out with every female in sight. Up to and including the heir to the throne. With whom he turns out to be genetically compatible. Odd note: Rygel is peculiarly interested in their kiss. I am fully prepared to blame the alcohol. Crichton is immediately taken to the Imperial palace, where he meets Prince Clavor and his attendant ro-NA (who would look familiar but for the fantastic makeup job). Clavor fails at fashion, directing underlings, intimidation… pretty much everything he attempts. One wonders how he managed to poison his sister’s DNA in the first place. Factor in the assistance from the Scarrans, and picture becomes clear. It’s important to note that at this point we’ve seen Councilor Tyno on his own, but Princess Katralla never shows up without him in the room. Subtle hinting. Elsewhere! Aeryn drags Chiana off to show her where the frell Crichton was hauled off to, and D’Argo is surprisingly mellow. But then Scorpius shows up. Lacking a sword, D’Argo grabs the next best thing. A cup. Scorpy does his usual elegant badass thing. D’Argo takes word of his offer to John, who now finds himself wedged between a rock and a hard place. Or, after he meets the Empress, between an irresistible force and an immovable object. This Empress will do anything to keep her empire neutral, even invite a halfbreed abomination into her home to force John to propose. You can see the desperation in his eyes when he does it. Even after, they’re darting around looking for a way to escape. John and Aeryn discuss the matter in a hallway surrounded by several dozen guards when Dregon Casanova Karzanova moves in and starts hitting on the now very definitely single Aeryn. She takes it about as well as she’s taken any romantic relationships this episode – poorly. And then she runs into the Scarran, which she then takes on in hand-to-hand combat. Scarrans have heat-based telepathy, debilitating to Sebaceans. They have enough natural armor to resist pulse fire, claws, probably super strength, and she fights it to a standstill. Either Aeryn is completely badass (entirely possible) or diplomatic envoy Cargn is Scarran weaksauce. And then Aeryn walks in on Crichton and Katralla in the baby projection room. Ouch. This isn’t the only sucker punch in the room, Tyro drops the bomb that Crichton’s going to be turned into a statue for eighty cycles. Disturbed by this turn, John goes to discuss it with D’Argo. Who is busy with Chiana. Crichton is sufficiently disturbed by the whole statue thing that he barely notices. More guy talk ensues. Y’know, it’s fantastic to see D’Argo and John getting along as well as they are. This episode, I think, goes a long way to turning D’Argo into just a guy. Sure, he has tentacle-bits and hyper rage and a prehensile narco-tongue, but he’s a dude. And bros stick together. John looks into the future and sees the end of everything he knows. D’Argo points out the potential in his situation. And, to conclude the episode, Crichton’s first assassination attempt. Daww. Things I skipped: D’Argo headbanging on the dance floor. Moya meeting her god. A surprising similarity between Rygel’s and Aeryn’s reactions to threats, specifically “Run, fight, surrender!” vs. “Fight, retreat, remain silent.” Cargn interrogating Clavor and Jenavian. Crichton talking with ro-NA. In conclusion, this whole tongue-touching thing reminds me very much of Thumb Wars. Man, it’s a really good thing that Aeryn mentioned that Sebaceans have wiped out most forms of disease; the Kiss Test™ would get really devastating otherwise. 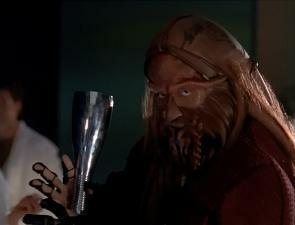 We’ve had two-parters before, but this is Farscape‘s first three-parter, and I’ve been looking forward to it. While cliffhangers are always annoying, the three-parters are always their best, and this one is no exception. Boasting amazing special effects for the cityscape exteriors and a much higher extra/makeup/costuming budget as well, “Look at the Princess” is a study in serial storytelling at its most familiar: the backstabbing almost-heir to the throne. Take all the science fiction stuff out of it – spaceships, aliens, magic baby prediction machines – and what you have is a perfectly serviceable political intrigue; namely, the eponymous Princess is the heir to the throne but her birthright is forfeit if she cannot find a proper mate. The sabotage of her courtship is orchestrated by spies who wish to set up their own figurehead, and be the real power behind the throne. Naturally, it falls upon Our Heroes to thwart the plan and set the more virtuous leader on top – ideally, with her own One True Love, but Crichton’s a fair second place. They don’t even care that he’s an alien; he’s compatible, he’s close enough to Sebaceans as to fool the general public, and he’s conveniently placed. I really wonder if the Scarrans aren’t playing the long game here; surely they have to know that even if Prince Douchebag was chosen, he wouldn’t be in power for eighty frelling cycles. Even if pretty much every race in the Uncharted Territories is ridiculously long-lived, a lot can happen in that time. People could be assassinated, war between the Scarrans and the Peacekeepers could break out, a truce could be made; pretty much anything. Unless, of course, they were also plotting to assassinate the Empress, thus bringing Prince Valium out of cold storage a few score cycles early. Food for thought. Makeup notes! Mrs. Ben Browder’s catperson makeup was pretty fantastic. I could have done a little less of Princess Makeout’s whiteface and red eyeshadow, which mostly just made her look diseased. Speaking of makeup, did Scorpius look a lot bluer to anyone else, or was that just a trick of the lighting? The director of this episode deserves an award. Everything’s really tight and spot-on, the camera work was amazing, and the pacing was nigh-flawless. There’s a bunch of really neat, rapid-fire blink-and-you’ll-miss-them visual gags in this episode. Try to count them all! Rygel was staring agape at the kiss, I gathered, because he knew she was the Princess, and the ramifications of which were hitting him full force. It makes a lot of sense to me; the reason they were allowed dirtside was ’cause Rygel offered a gift for the coronation, and flaunted his Dominar status to do it. Of course he’d have been introduced to the royalty – or at least toadied about to find this out in an attempt to find something he could use towards his advantage. Speaking of Rygel, this is yet another reason why they haven’t tossed him out the airlock yet. The dude has a Charisma of 23, man. He succeeded on a Diplomacy check against a dire rat frelling Scorpius. Of course he’s going to be useful for scrounging supplies, getting discounts on food, and screwing crooked merchants before they get screwed themselves. For a fugitive ship with extremely limited resources and a steadily growing number of mouths to feed, it’s more than worth the tradeoff. And meanwhile Moya with Zhaan run away when Scorpius’ command carrier shows up and Moya meets with her deity , her God in a nebula. And this is just for the first part…Damn ! I also love these episodes. Ben’s acting is superb — Crichton is soo frustrated, alone, scared, and fighting. I think there is a misunderstanding of John’s behavior on the planet. He isn’t kissing everyone in sight — they are kissing him but he gets into the swing of it to try and get Aeryn to notice (which she does). I never get the feeling that he is actually totally understanding the ramifications of all this kissing, and he definitely does not want to kiss Katrella but is diplomatically forced to. Oh, and if you watch the bridge dynamics carefully, it wasn’t Rygel’s speech that got Tyno to invite the guys down, but his view of John behind Rygel that produced the invitation. Tyno thought he had a new Sebecean outside of the planet’s population to thwart Clavor’s plans. It is pretty subtle. Interesting casting notes. For years everyone was wondering if the little boy in the imaging chamber was Ben’s son and for years he denied it. But about two years ago, Francesca Buller admitted at a Farscape con that yes, that was their son. Which explains the joy and how well the little boy projected love back to John. We learn of the importance of Family to John again. Kahanu, the Builder is played by Jonathan Hardy (who voices Rygel). I love all the snark. And John is desperate and dropping Erpisms right and left and trying for the macho guy behavior (at least with Clavor) and in my book failing. And Aeryn is fighting her emotions all the time. All he wants is his princess — a motif that returns 4th season. Kahaynu is Rygel? That’s completely awesome.